Listening to Portuguese Dolentia on their most recent Iniciacao Eversiva I could not shake two sentiments – the feeling of partial familiarity, although I have never even heard of the band’s existence, and the slight pang of regret that much more could have been possibly done with the presented template. But, first, good news. 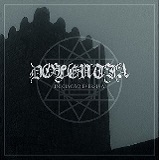 Unapologetically raw, with a deep embedded underground mentality, Dolentia plays atmospheric black metal you could hear from their spread around the world brethren in spirit, French Celestia, a number of crews from the Quebecois scene or even glimpses from early Winterfylleth. Although the promo materials that came with Iniciacao Eversiva claim some occult topics, I sense a strong epic historic streak on the album, heroic at times, and the band is definitely proud of its origin, and to prove it they have some of the native melodies on full display. I am not an expert on ancient Lusitanian motifs, but, apparently, it is those melodies Dolentia endlessly weaves, whether they are applied over a steady beat, or when the band quickly switches to a familiar blast (Voragem). Dolentia guitars are layered trumpets of war, incessantly calling us to battle (Entre Tumulos Esquecidos) in one rousing epic rush. In that context, the band also goes in an appropriate direction trying to incorporate slower, militaristically sounding, sections to provide a few step asides away from the grating. The problem with Dolentia sound is that their bottom end is not strong enough. When ancient hordes rushed into skirmishes the trumpets indeed played, but the drums provided the monstrous pounding. Dolentia lacks the hefty bombast, so their trumpets, aka guitars, overmatch their drums. Further, their vocalist possesses a pretty high timbre shriek, and he always intones up in a phrase, plus echoing voice effects exist. Thus, everything Dolentia does feels like climbing the ladder in only one direction, up, without an end in sight. Couple that with very lengthy songs, and Inciacao Eversiva may start feeling repetitive from the very start. If I just listened to an 8 min of Voragem, do I really need another 8 min of Guardiao das Almas? Supremo Designio provides a cool melodic riff around 5’20”, Do Fundo dos Abismos has much more desperation in its melody making it instantly stand out, and A Noite becomes totally dissonant and careens out of control, but largely, Dolentia can get a little oppressively monotonous, especially if you don’t understand the subject theme, are not looking at the booklet to imbibe in the visuals, and only rely on the wall of sound relentlessly washing over you. Not satisfied with just a new album, homeland Altare Productions decided to tack on a pair of older tracks from an earlier demo. A conjoined Lapidis/Sacrificium, one of the band’s live staples, is wild howls euphoria set to either fast tremolo or slower defined chord structure, and Era Portucalensis will make it its mission to engrave its main riff as your permanent brain tattoo.